Nagasaki was a city on the west coast of Kyushu on picturesque Nagasaki Bay. It was famous as the setting for Puccini's beautiful opera Madame Butterfly. It was also home to two huge Mitsubishi war plants on the Urakami River. 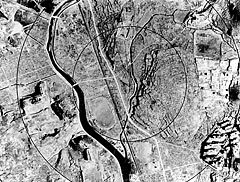 This complex was the primary target, but because the city was built in hilly, almost mountainous terrain, it was a much more difficult target than Hiroshima. Clouds covered Nagasaki when Bock's Car arrived. Contrary to orders, weaponeer Ashworth determined to make the drop by radar if they had to due to their short fuel supply. At the last minute a small window in the clouds opened and bombardier Captain Kermit K. Beehan made the drop at 10:58 A.M. Nagasaki time. 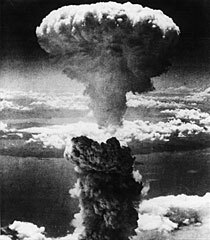 Fat Man exploded at 1,840 feet above Nagasaki and approximately 500 feet south of the Mitsubishi Steel and Armament Works with an estimated force of 22,000 tons of TNT. Unlike Hiroshima, there was no firestorm at Nagasaki. Despite this, the blast was more destructive to the immediate area, due to the topography and the greater power of Fat Man. However, the hilly topography limited the total area of destruction to less than that of Hiroshima, and the resulting loss of life, though horrifically high, was also less. The exact number of casualties was impossible to determine. The Japanese listed only those they could verify and set the official estimate at 23, 753 killed, 1,927 missing, and 23, 345 wounded. U.S. Strategic Bombing Survey figures were much higher, but still less than those for Hiroshima. Within a minute of Fat Man's explosion, a brilliant fireball boiled skyward. Sweeney banked sharply to avoid it. The two B-29s were battered by five successive shockwaves and the radioactive cloud surged toward them. Both planes turned away and headed home.